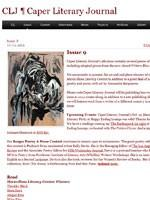 CLJ publishes high-quality poetry and prose from American and international established and emerging authors. Though CLJ is primarily an online publication, we print yearly anthologies. CLJ's aesthetic leans toward the surreal or slipstream. We enjoy magic realism, surrealism, complex characters, feminism, reinvention of mythology and folklore, oddities, writing focused on culture and heritage, detail and beauty. Caper holds contests, literary events and nominates for major prizes. We are very selective but open-minded. GGeneral General Open to all/most Subgenres, including: Magic Realism, Slipstream. FFlash Fiction Flash Fiction 300 - 1,000 words.